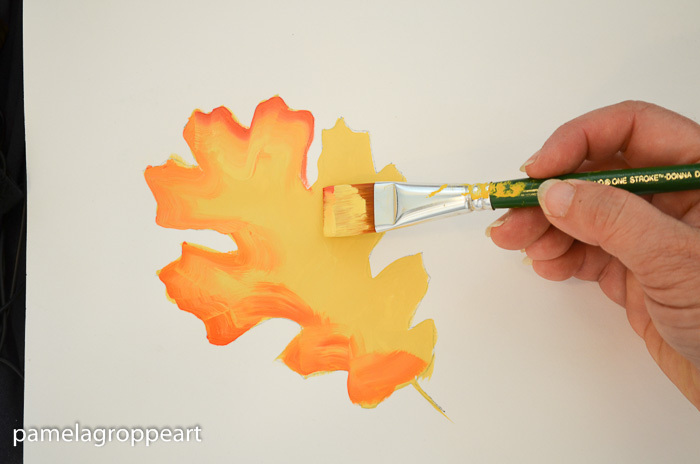 How to paint Fall oak leaves one easy stroke at a time. 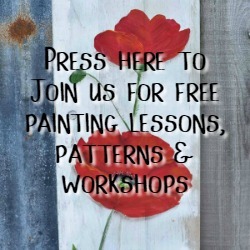 Create shading, texture and more in this beginner friendly DIY painting lesson. 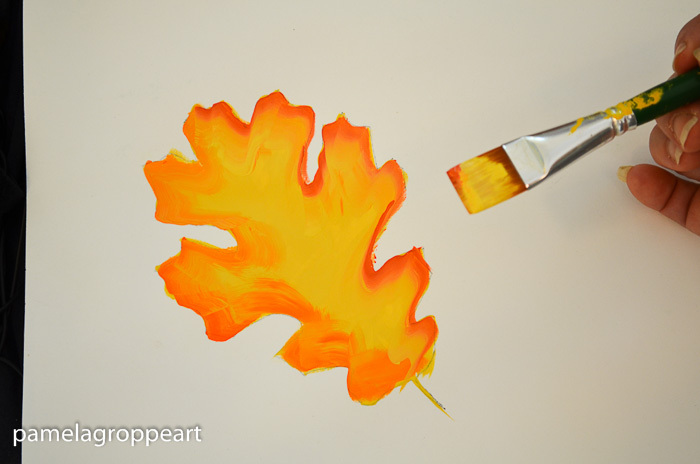 Today I share how to paint Fall oak leaves, an easy beginner friendly painting tutorial. The DIY Fall sign I posted over on Flower Patch Farmhouse has leaves and acorn on it. No time now? PIN for later! 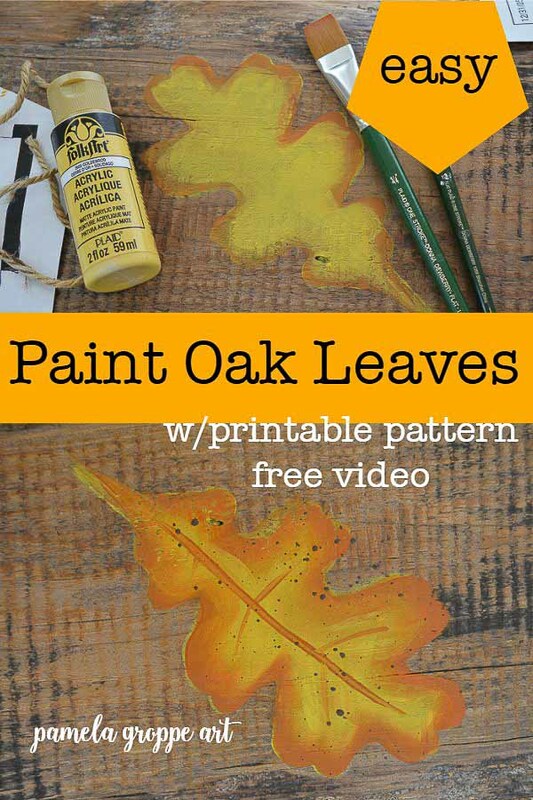 I have a downloadable oak leaf pattern for you to use, just fill out the form at the end of this post. 1.Start by transferring your design with the graphite paper then you are ready to begin painting. 2. 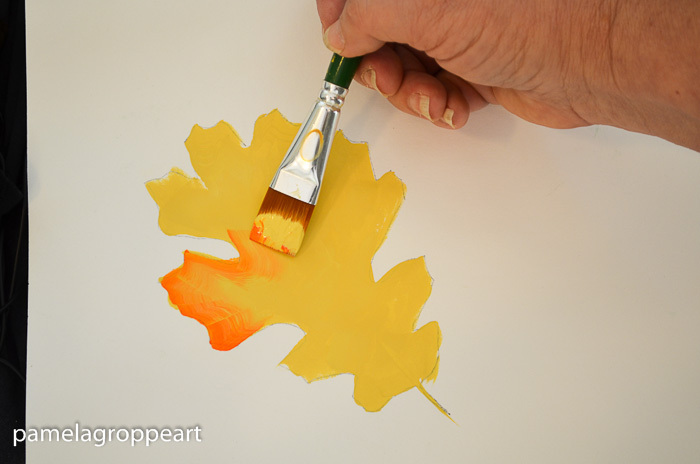 Load the 3/4″ brush with Buttercup (in the video I use Goldenrod) and fill in your leaf. You can use a smaller flat brush if you wish. Fill it all in, don’t worry about being perfect, enjoy the process. Notice how I still have the yellow in the brush and just dip the corner into the orange-ish color, I blend it a bit on my palette. 4. 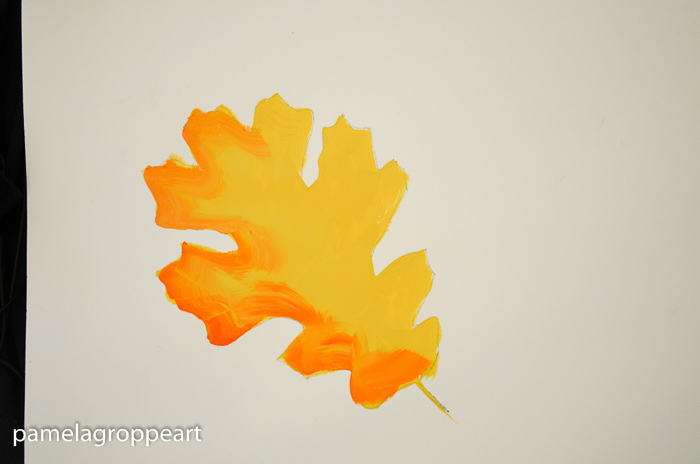 Along the left side of the leaf paint the orange, blending in as you go. The yellow base coat is still wet. Do this all along this edge. You will see it in action on the video, that is at the end of this post. 5. Now you can just go along the right side with the same color as the left or put a different color (I used Autumn Leaves) on the right side of the leaf. 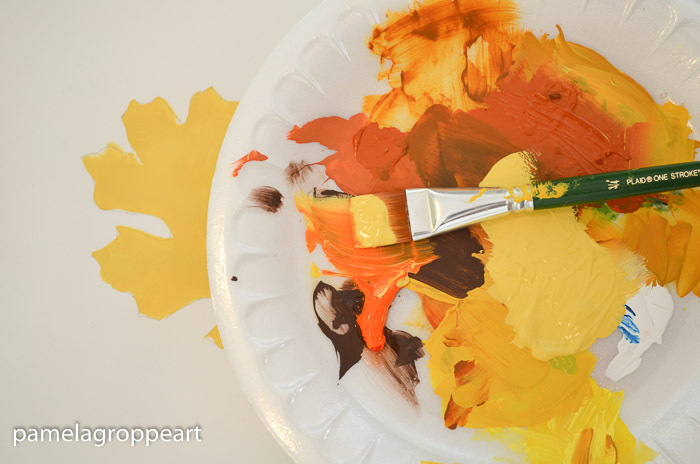 When using a different color wipe your brush out a bit on a dry rag or paper towel. Don’t rinse, just remove the excess paint. 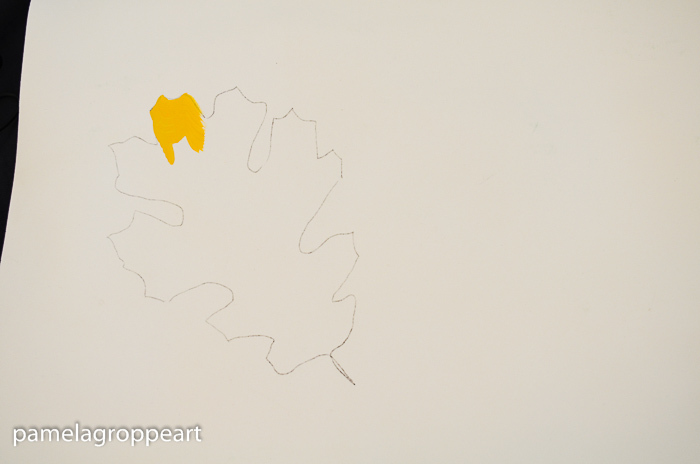 Load your next color as you did the orange and proceed to shade the right side of the leaf. You will note that there is still some orange in the brush and that is creating another tone, that is great. No two leaves will be exactly alike. We don’t want neat and tidy, we want messy, mottled color that gives interest. 6. Now add the veining with the corner of your brush, just drag it down in a relatively straight line, and then the side veins too. 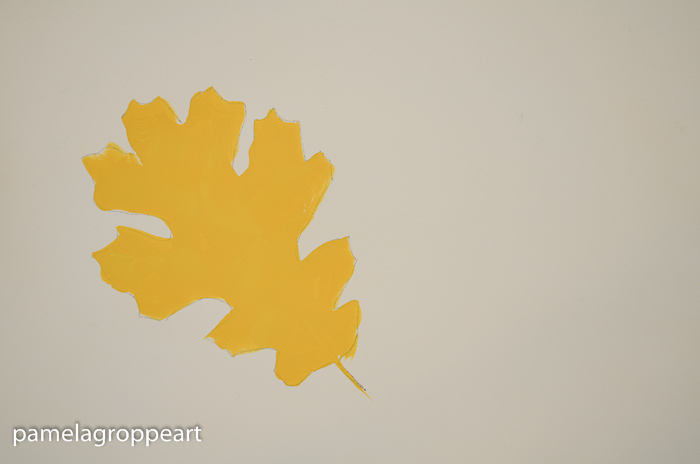 There you have an easy to paint Oak leaf. I know that typical oak leaves are not such bright colors. At least around here they are more of a muted tans and browns but that is the great thing with art, you can jazz them up all you like! In the video I share how to shadow them to give a more 3-D effect. Click here for my complete list of painting supplies including what I use for cleaning my brushes so they last a long time. A downloadable checklist is available. For a free pattern for the oak leaves just fill out this form to get access to the subscribers only resource, I have free patterns available for you to print to use. Already a subscriber? 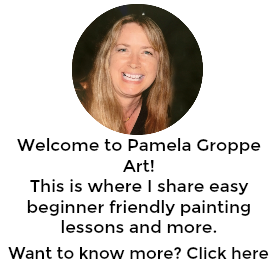 Just use the password I send in each and every email. 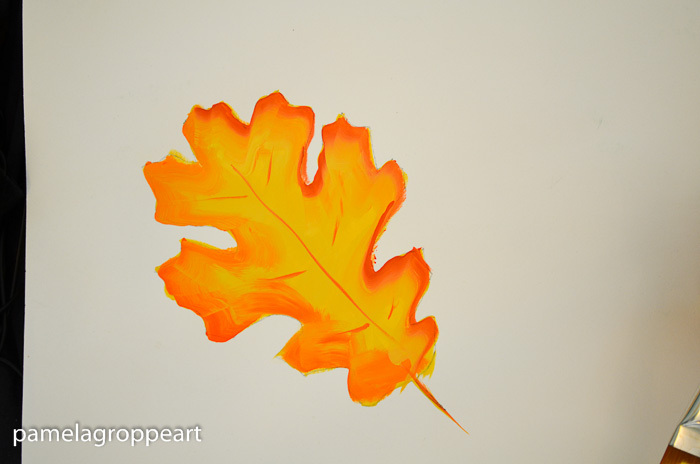 Click here to see how to create a fabulous Fall sign with Oak Leaves!